Patra's Other Place: Front yard upgrade. Our Topsy has passed away. Ringtail possum, and a taste sensation. Montsalvat, the Eltham artists' colony. 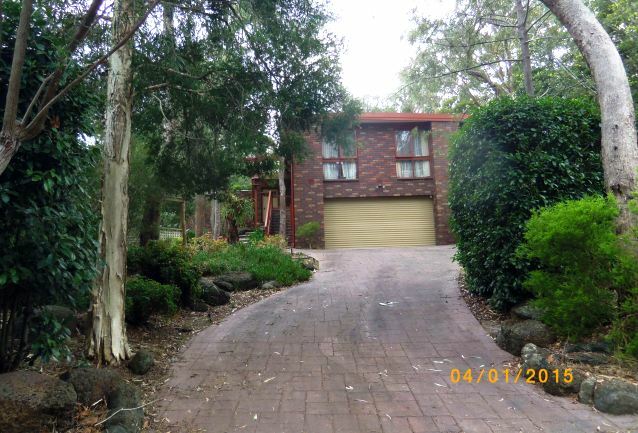 When we first bought our house it was only six years old and the gardens back and front had been nicely landscaped. But as time went on, plants died, things became untidy, and Ken did quite a bit of work himself, putting retaining walls in and moving rocks around. Then we got a professional landscaper to redo the front completely and it looked great for about 10 years or so. Again, it started looking untidy, but by then Ken wasn't up to digging it all up and starting again, so we had a few gardeners come and go, doing bits here and there. When we had our back yard fixed up (again!) 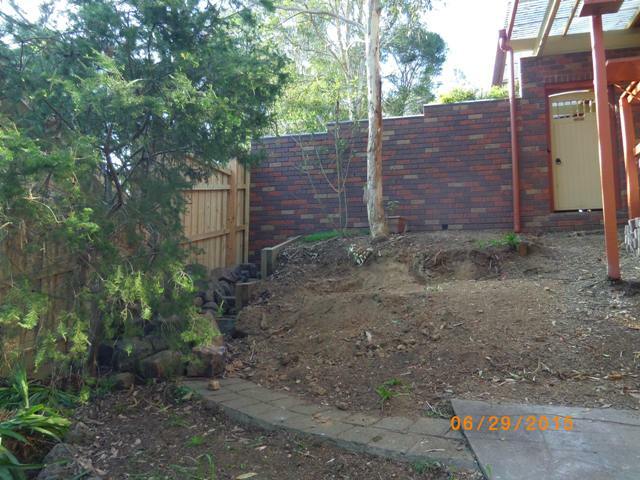 last year, the man who did that job (Tony) said he would like to have a go at the front yard one day. He turned up on the doorstep last month and said "I'm back!" He and an offsider have been hard at work ever since, and Ken and I think it is going to look very good indeed by the time they are finished. 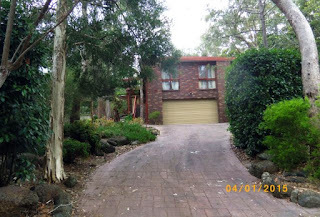 The photo below was taken last year, and you can see the rocks along the side of the driveway. At the footpath end, they have been a nuisance when people are backing their cars down the drive, as they are hard to see, and I hate to think how many cars (including ours) have scraped against those rocks over the years. Tony hired a back hoe and reefed all the rocks out and repositioned them further away from the side of the driveway. 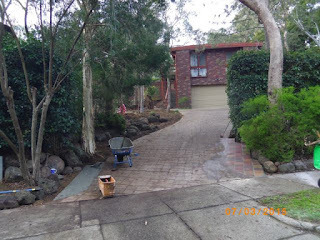 He used pavers (recycled from the stack in the back yard) to pave the area where the rocks were, and while it is obvious where the concrete drive and the pavers meet, it has made it so much easier to drive in and out. 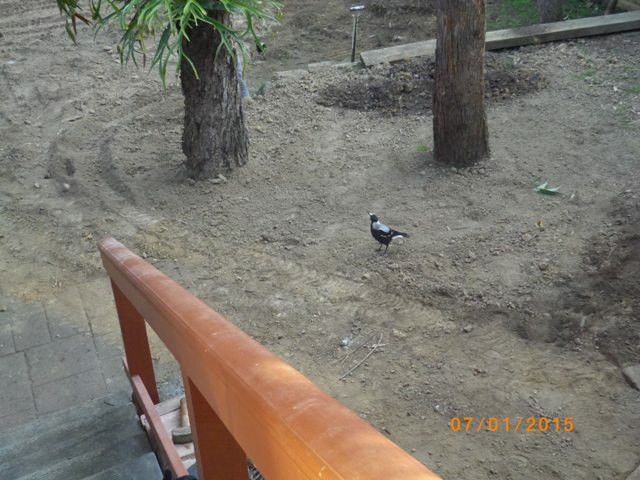 He will be tidying that area up later on with a few small plants and rocks to hide the edges. 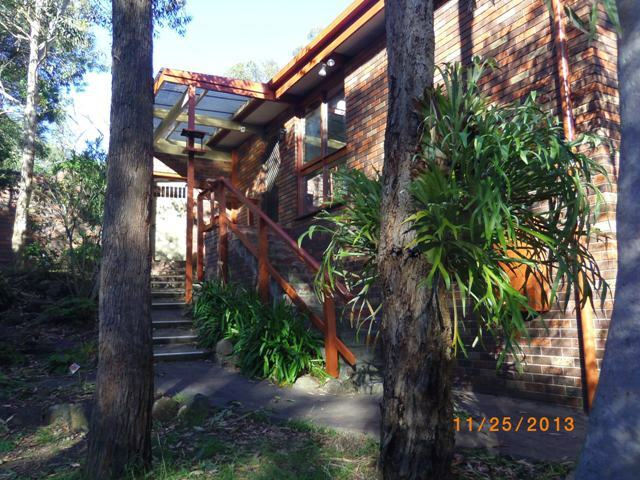 The photo below shows the steps up to our front door. 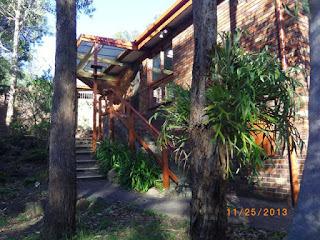 There are also some steps up to the back gate, which are very rarely used, as if we go to the back yard we always use the path on the other side of the house. So these steps have been neglected over the years, and were starting to fall apart and become dangerous to walk on. Tony has removed all the old steps as well as the agapanthus and all the plants that were there except the mature flowering gum and Hibiscus. The little path at the bottom of this photo has gone too. Ken put that in about 30 years ago, and we were a bit sad to see it go, but Tony has grandiose plans for the yard and said it wouldn't look right with the new landscaping. He is going to build steps to the gate with bricks, and have a circular brick area at the foot of the steps. A retaining wall will be build with the bluestone rocks he pulled out from elsewhere. I am very pleased that he is big on recycling what has been used before elsewhere! 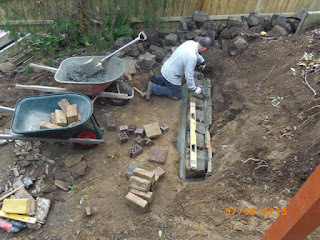 Here he is placing the first level of bluestone rocks, before they finished up for the day. The magpies thought it was wonderful when they dug up the whole yard and disturbed all those worms! 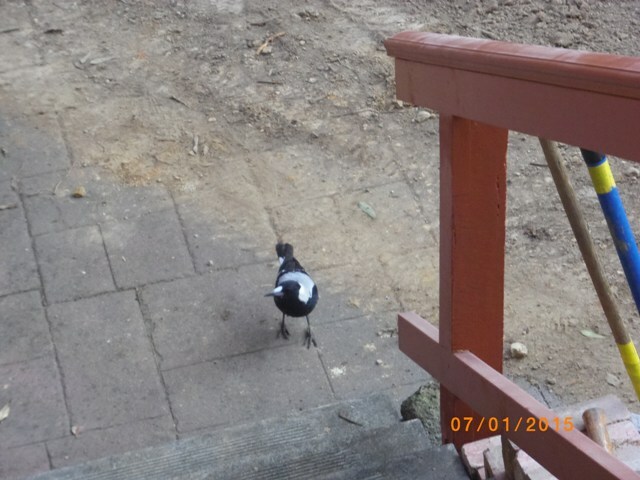 Enough to feed the magpie family for a few weeks! My bloggy friend in Scotland will be shocked to know that all the geraniums have been pulled out and taken to the tip. Sorry Pam! I know how you admired those big bushes, but they had got very woody and untidy despite my regular pruning, so they had to go. I picked a few bits off and planted them in the back yard, so it won't take long before they shoot up and start flowering again. At least you took some cuttings! I'm just intrigued at the idea of geraniums (I'm assuming they're pelargoniums) surviving through the winter outside. Doesn't happen here except in very mild winters, and even then they never really grow more than an inch or two in the summer because they've got so cold in the winter. That all looks very impressive! This is going to be great when he is finished. How about sending him over for a visit. We are at a point where it is beginning to look like a jungle and I am not able to do it. Our landscaper? is supposed to do a lot of it but with all the rain we hardly have seen him. When you ask it is manana. Maybe next year a new landscaper.